There is good reason BioSteel is the only brand of sports supplements offered by the Hockey Players Club. Their commitment to providing an evidence-based product made with the highest quality ingredients is simply unparalleled in the supplement world. It’s difficult to spot an NHL locker room where you can’t find the naturally-colored pink performance drink. Besides the fact it tastes great, we have 5 other reasons we believe every hockey player [it’s perfectly safe for kids too!] should be drinking BioSteel’s High Performance Sports Drink. And don’t forget to take advantage of our free shipping and include it in your next Hockey Players Club package! Utilizing the same scientific approach he applies to training, Nichol is similarly well versed in nutrition and sports supplements. 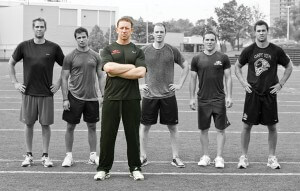 After working in sport supplement formulation, where Nichol sourced the highest quality ingredients and techniques from around the world, he became Canada’s first Certified Metabolic Typing Advisor where he’s able to scientifically identify and optimize an individual’s diet and supplement intake. Unlike most sports drinks, BioSteel contains no sugar, preservatives, caffeine, lactose, additives, or unnatural coloring. It’s rich in electrolytes, gluten free, and diabetic and vegan friendly. All in all, this stuff is built for the athlete who wants nothing but the safest and best to fuel their performance. BioSteel is designed to help athletes improve their focus, recover faster, and perform better. Using the highest quality ingredients, their team’s proprietary blends deliver just that. Performance backed by science?! Count us in! The bodies of professional athletes play a crucial role to their success. Therefore they have constant access to the latest and greatest advancements in sports supplements on the market. It’s doubtful the likes of Connor McDavid, Carey Price, Rory McIlroy, Andrew Wiggins and Dez Bryant [just to name a few] would drink BioSteel if they didn’t believe it complemented their game. These superstars simply wouldn’t risk their livelihood and potential trophies on something they believe unproven or unworthy. While we’d never suggest to follow the pack, these guys seem to know a thing or two about performing under pressure at the highest level. While their High Performance Sports Drink is a game changer, BioSteel isn’t stopping there. Whether it’s improving their packaging [have you seen their Ready-To-Drink bottles yet?] or formulating new products to their incredible standards, BioSteel is a brand that’s just getting their legs under them. We already love their Advanced Recovery Formula and look forward to trying their Protein and Nutrition Bars soon. Like their sports drinks we know their new products will only have the best interest of the athlete in mind. Thanks to their transparency and commitment to quality, we recommend BioSteel to every hockey player who cares about what they put in their body. Make sure to include it in your next HPC package! ——— Are you a member of the awesome hockey tape subscription service, the Hockey Players Club? If not, save yourself time and money and join now!